The U.S. Patent and Trademark Office on Tuesday issued Apple a patent for an audio-based input system in which various noises made on a laptop's chassis are translated into actions, basically turning the computer into one large input device. Apple's U.S. Patent No. 8,441,790 for an "Electronic device housing as acoustic input device" describes a system in which user input, such as taps, scratches or other noises, are picked up by acoustic transducers or microphones integrated into a device's chassis. These sounds are then processed, with corresponding actions resulting from comparison with predefined waveform data. In one embodiment, the audio transducer or transducers "sense" a sound wave generated by user's interaction with an electronic device. When coupled with a microprocessor, the sound can be distinguished and interpreted to output the appropriate signal. The interpretation maybe based on the type of input, nature of the input, the location of the contact on the housing, the amplitude of input, as well as other various other factors. For example, a scratch may be interpreted differently from a tap, and so forth. Additionally, a tap on the housing near an output or input device may actuate the device whereas a tap on another surface of the housing may be interpreted as a keystroke. A sound "vocabulary" is employed to distinguish patterns and locations of noise input. For example, three taps near a camera can turn said device on, while another tap can snap a picture. Other forms of interaction, such as scratching or moving a finger along the device surface, can also be interpreted. As computers tend to have moving parts like a hard drive or cooling fans, the patent calls for acoustic isolation in the form of either physical barriers constructed around the noisy components. Another embodiment calls for a software-based solution that ignores the sound signature of a certain part, for example a DVD drive. Noise interference can also be dealt with by subtracting signal data from an external transducer, much as the iPhone cancels sound with its secondary microphone. Apple notes that the invention can be used as a replacement for a physical keyboard, with the sound of tapping on a computer housing being enough to generate the appropriate onscreen information. For example, micro perforations backlit by LEDs or a solid surface can be used instead of a QWERTY keyboard. The system can also be configured for use as a trackpad. When applied to a mobile phone, the patent can be used as a simple input gesture, such as stopping an call from ringing. One of the more interesting examples described is when a user drags their finger up or down on the back of a device, thereby increasing or decreasing volume output. Yet another embodiment allows a user to tap a device housing near a specific component like a camera or speaker to activate it. Multiple acoustic transducers in a device housing (106). 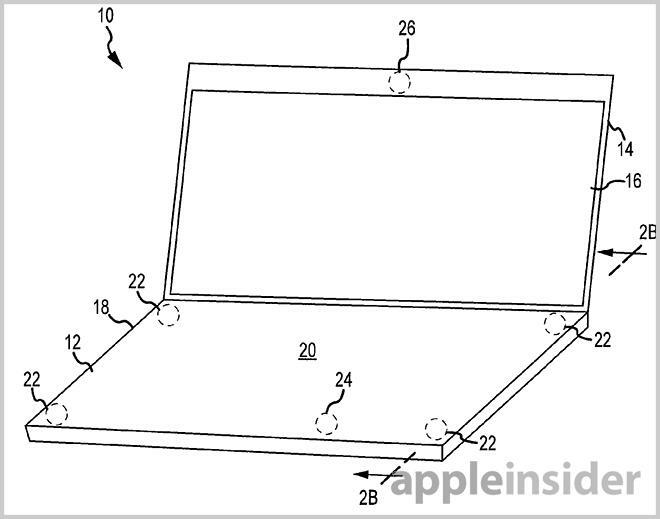 It is unknown if Apple will deploy such technology in a future device, as the advent of capacitive touch technology is simpler and more precise for many operations outlined in the patent. For other purposes, like tapping anywhere on an iPhone to answer a call, the property could come in handy. Apple's acoustic input patent was first filed for in 2009 and credits Aleksandar Pance, Nicholas Vincent King, Duncan Kerr and Brett Bilbrey as its inventors.